The HP 150 was Hewlett Packard's attempt to produce a user friendly office computer. It is an MS-DOS based system, but is not IBM compatible. It made heavy use of function keys and the built in touch screen to attempt to produce easy to use software. The computer is built into the display unit with disk drives as external units. It is the successor of the HP 120 (which runs under CP/M). It uses the same screen and the same case as the HP 120. The keyboard was made in Singapour and the cathodic tube was from Matsushita. But the whole system was assembled in the US Sunnyvale and Corvallis factories, and in Grenoble (France). One of its main interesting characteristic is its "touch sensitive screen" (a 9" Sony screen). Actually, it's not a true touchscreen, there's a lot of infra red transmitters and receivers around the screen which detect the position of anything on the screen : a finger of course but a pencil too. The idea of the touch screen came from HP Grenoble, but the concept was developped in the USA. The HP 150 uses a shell or interface program called the Personal Application Manager or PAM rather than the standard DOS command line shell. This allows the user to select installed applications from the screen. In addition there are utilities to install applications under PAM, format disks and configure peripheral devices. 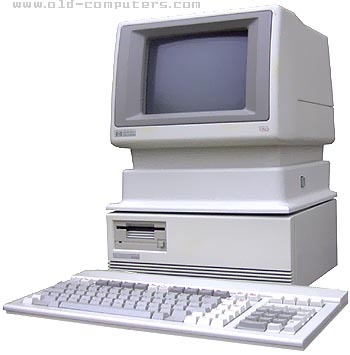 Notice that the HP 150, as the HP 120, uses 3.5" floppy disks when all other computers used 5.25" floppy disks. The first models used 270 KB disks, they were replaced with 720 KB floppy disks. It was possible to insert a small thermic printer into the screen. It was a user installed upgrade. It functioned via internal connections, and would work either as a DOS printer, or direct from the screen for logging, etc. It printed on 80 columns and used a continuous roll of special paper. The packing of the 150 was very robust. More than one was rolled down a stairway, then powered up as a demo ! see more Hewlett Packard HP-150 Ebay auctions !